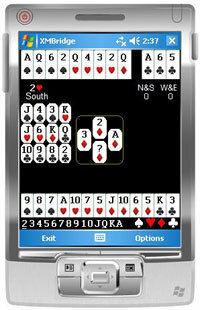 Contract Bridge simulation for Windows Pocket PC / Windows Smartphone. The random deal engine will produce an unlimited variety of hands. The program will bid and play the other three hands with scoring to rubber. A deal may be quickly saved, with dealer, at any time. The program will also generate specific point count hands in the 0-28 point range. The program is suitable for casual play and practise. The Bridge engine utilized has been proven on several other platforms (including Colossus Bridge for Windows) and provides a interesting game but may not be suitable for strong club players. $9.99 Includes UK or international shipping. A display of 240 by 320 is required. The program is optimized for that size and is not suitable for larger VGA size displays. It may be used with a stylus (recommended) or device keyboard (not screen keyboard). 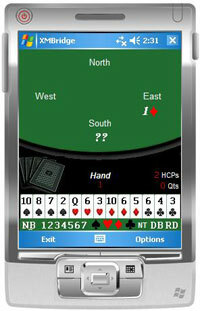 The program requires a Windows Pocket PC / Windows Smartphone with Windows Mobile 5, 6 or later. It is not suitable for use with Pocket PC 2003. The product is supplied on CD with standard cab installation. Yes, the program requires activation via a code that is emailed. Is the program available locally? No, Bibase software maintains the competitive price by selling direct. If you find the product available elsewhere we would very much like to hear from you. Yes, just click the Order Now button at the top for secure online ordering. The page is operated by our credit card processor, Worldpay, owned by the Bank of Scotland. The price includes postage and packing (delivery in about 7 days to the USA). We also accept Paypal from the same page. Orders from the UK include recorded delivery.